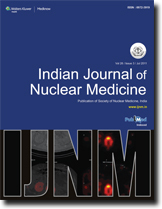 Aim: To define the range of phase spread on equilibrium gated radionuclide ventriculography (ERNV) in normal individuals and derive the cut-off limit for the parameters to detect cardiac dyssynchrony. Materials and Methods: ERNV was carried out in 30 individuals (age 53±23 years, 25 males and 5 females) who had no history of cardiovascular disease. They all had normal left ventricular ejection fraction (LVEF 55-70%) as determined by echocardiography, were in sinus rhythm, with normal QRS duration (≤120 msec) and normal coronary angiography. 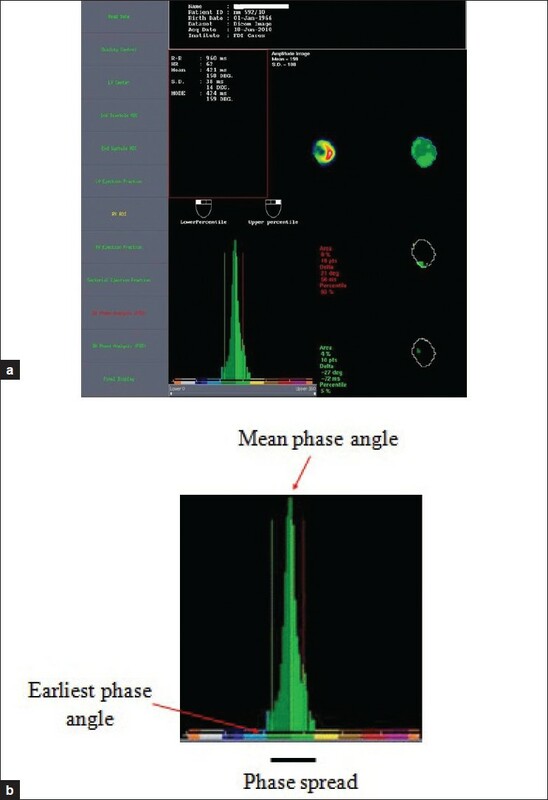 First harmonic phase analysis was performed on scintigraphic data acquired in best septal view. Left and right ventricular standard deviation (LVSD and RVSD, respectively) and interventricular mechanical delay (IVMD), the absolute difference of mean phase angles of right and left ventricle, were computed and expressed in milliseconds. Mean + 3 standard deviation (SD) was used to derive the cut-off limits. Results: Average LVEF and duration of cardiac cycle in the study group were 62.5%±5.44% and 868.9±114.5 msec, respectively. The observations of LVSD, RVSD and right and left ventricular mean phase angles were shown to be normally distributed by Shapiro-Wilk test. Cut-off limits for LVSD, RVSD and IVMD were calculated to be 80 msec, 85 msec and 75 msec, respectively. Conclusion: Fourier phase analysis on ERNV is an effective tool for the evaluation of synchronicity of cardiac contraction. The cut-off limits of parameters of dyssynchrony can be used to separate heart failure patients with cardiac dyssynchrony from those without. ERNV can be used to select patients for cardiac resynchronization therapy. Aim: To determine the diagnostic reliability of 18 F-FDOPA, 13 N-Ammonia and F18-FDG PET/CT in primary brain tumors. 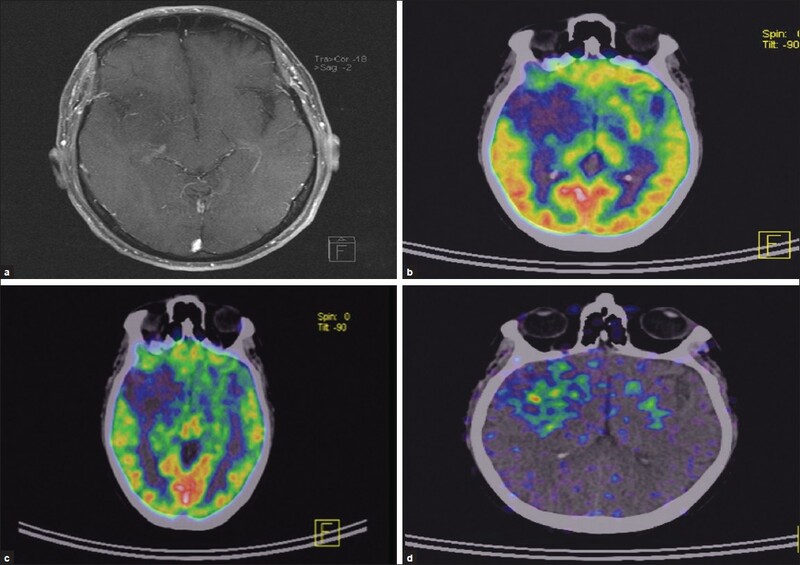 We evaluated the amino acid and glucose metabolism of brain tumors by using PET with 18 F-FDOPA, 13 N-Ammonia and F18-FDG PET/CT. Materials and Methods : Nine patients undergoing evaluation for brain tumors were studied. Tracer uptake was quantified by the use of standardized uptake values and the ratio of tumor uptake to normal identical area of contra lateral hemisphere (T/N). In addition, PET uptake with 18 F-FDOPA was quantified by use of ratio of tumor uptake to striatum uptake (T/S). The results were correlated with the patient's clinical profile. 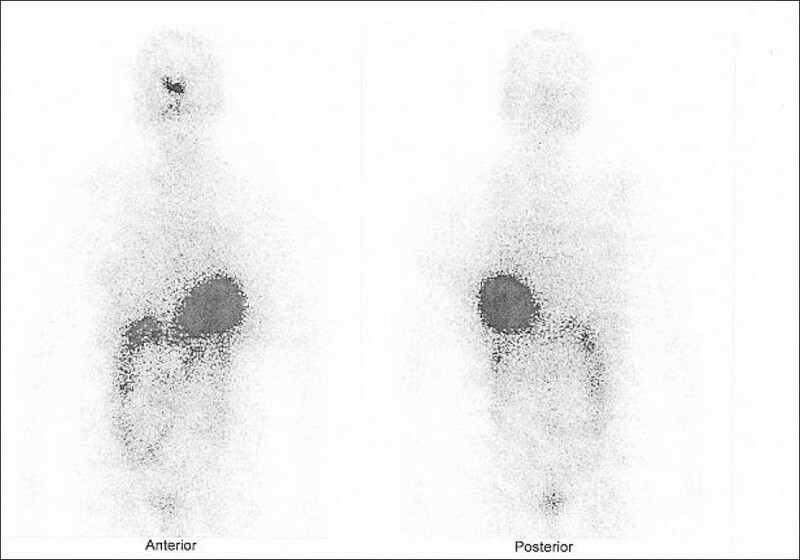 Results : Both high-grade and low-grade tumors were well visualized with 18 F-FDOPA. 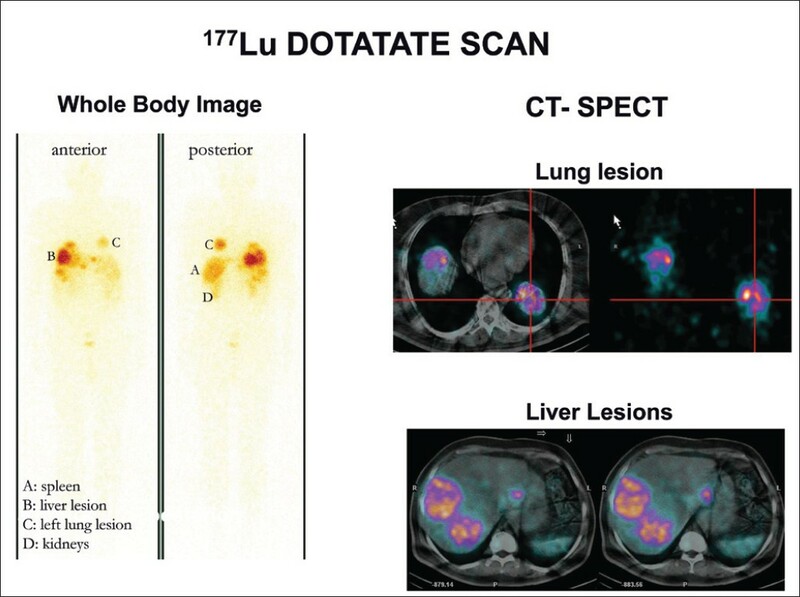 The sensitivity for identifying tumors was substantially higher with 18 F-FDOPA PET than with F18-FDG and 13 N-Ammonia PET as determined by simple visual inspection. The sensitivity for identifying recurrence in low grade gliomas is higher with 13 N-Ammonia than with F18-FDG. Conclusion: 18 F-FDOPA PET is more reliable than F18-FDG and 13 N-Ammonia PET for evaluating brain tumors. Background: The bacterial endotoxin test (BET) performed using gel clot method is a 60-min test and typically performed after the decay of the 2-( 18 F) fluoro-2-deoxy-d-glucose (F18-FDG) sample to determine the endotoxin content. 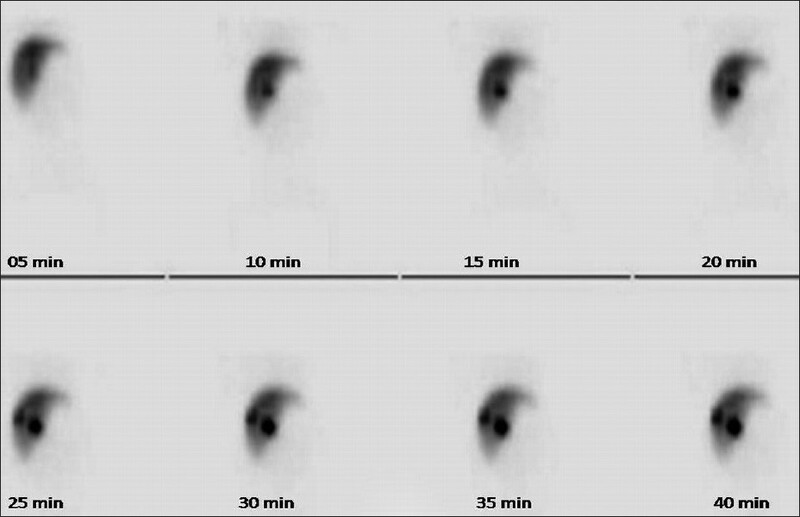 The objective of this study protocol was to perform BET testing of F18-FDG by gel clot method. Materials and Methods: Ten random decayed samples of the F18-FDG were subjected to the gel clot BET. The assay was performed with undiluted F18-FDG and at four different maximum valid dilutions of 1:10, 1:100, 1:350 and 1:700 (total number of tests = 100). The sensitivity of the LAL reagent used was 0.125 EU/ml. Endotoxin dilutions were freshly prepared from control standard endotoxin (CSE) stock solution for each F18-FDG batch testing. If the gel had formed and remained intact in the bottom of the reaction tube after an inversion of 180°, the test was considered positive. Any other state of the reaction mixture constituted a negative test. Results: In the undiluted samples, the measured pH (7.05) was well within the acceptable range (i.e. 6.0-8.0) for the gel clot assay. Of the 10 undiluted F18-FDG batches and all the diluted samples, none gelled after 60-min incubation period at 37°C. However, the undiluted F18-FDG did inhibit gel formation at the lysate sensitivity of 0.125 EU/ml. Conclusion: The total volume of FDG produced was 16 ml in the synthesis module. The total F18-FDG preparation at any time did not contain more than 8 EU (0.5 EU/ml Χ 16 ml). Thus, the product is safe for human administration. 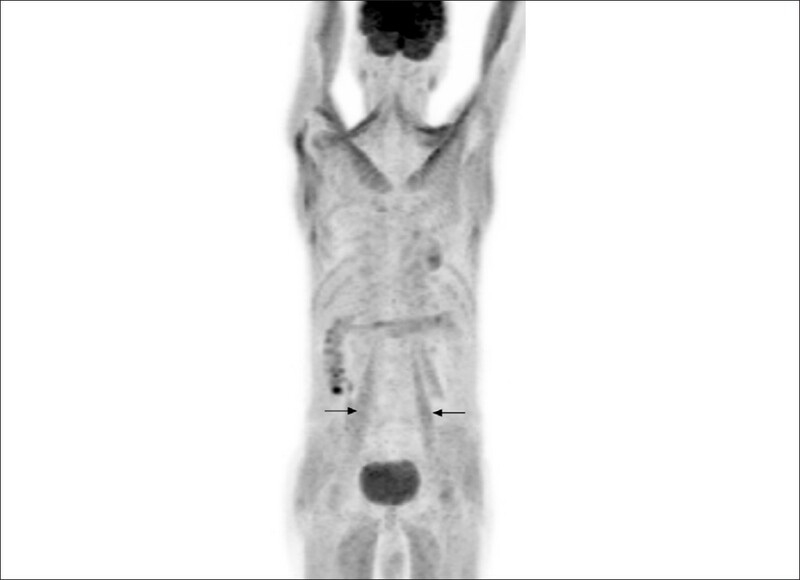 Functional imaging using radionuclide Tc99m pertechnetate is routinely used in the evaluation of the problems related to the thyroid gland. Scintiscan has been useful in the visualization of thyroid tissue in ectopic sites due to congenital developmental anomalies. Similarly, the scan helps in establishing the diagnosis of autonomously functioning nodule when the nodule being evaluated appears "hot" with suppression of rest of the gland activity. Here, we present a very rare case of autonomously functioning thyroid adenoma in an ectopic focus of accessory thyroid tissue in the mediastinum. F-18 fluoro-deoxyglucose (FDG) uptake in the thyroid and thymus is well reported in patients with Graves' disease. Incidental skeletal muscle uptake has also been reported in other non-musculoskeletal (benign and malignant) pathologies. We report a patient of Graves' disease showing symmetrical skeletal muscle uptake but no thyroidal or thymus uptake of FDG. A 47-day-old female infant presented with congenital inguinal hernia, seizure on the 2 nd day of life, fever, progressive jaundice, acholic stools and distension of abdomen. She was suspected to have choledochal cyst with extrahepatic biliary atresia (EHBA) and referred for an Hepatobiliary Tc-99m iminodiacetic acid (HIDA) scan. 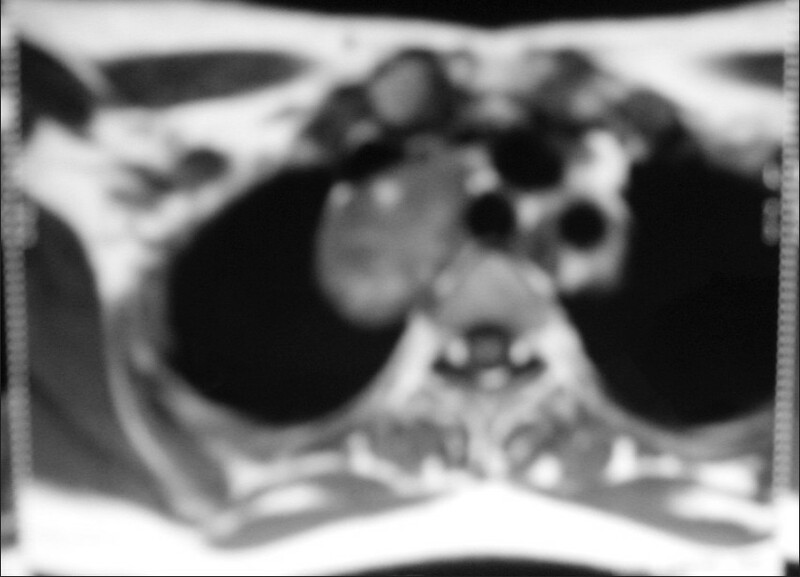 On HIDA scan, a functional diagnosis of ruptured choledochal cyst was made which was not possible on anatomical imaging like ultrasound (USG)/computed tomography (CT) scan. This was supported thereafter by bilious aspirate on abdominal paracentesis. Immediate laparotomy with T-tube insertion was done. The child improved dramatically after the procedure. Biliary peritonitis secondary to cyst perforation or rupture is a rare complication reported to occur in 1-2% cases of choledochal cyst. Early diagnosis and management is the key to reduce the morbidity and mortality. Scintigraphic differentiation between acute torsion, hydrocele and testicular or scrotal abscess can be difficult. Doppler sonography may provide useful complimentary information toward diagnosis. The authors describe a 5-year-old child where epididymitis with hydrocele was misdiagnosed as testicular torsion on scrotal scintigraphy. 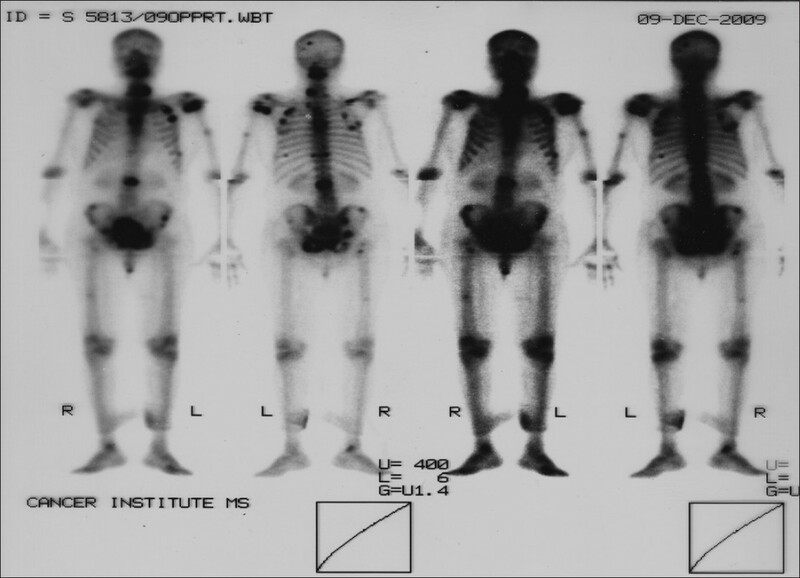 Bone scintigraphy with Tc-99m methylene diphosphonate (MDP) is used to detect metastases in patients with cancer. Uptake in non-osseous, non-urologic tissues is occasionally found in the routine bone scintigraphy, which may mimic as metastatic lesions. 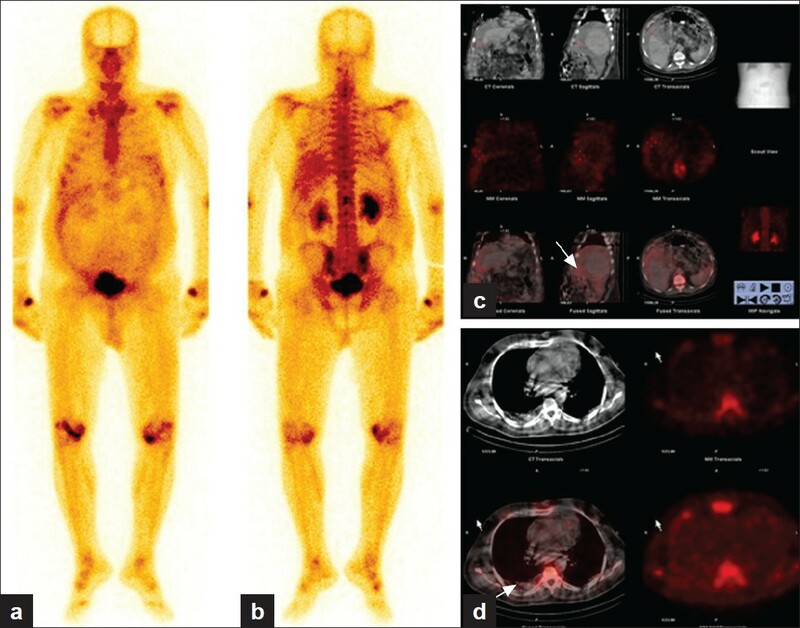 The authors describe the case of a 70-year-old man with prostate cancer, showing diffuse tracer uptake in the left hemithorax and entire abdomen on bone scan that required additional imaging modality for localization. Careful interpretation is needed of the unusual uptake of radiotracer in regions other than the skeleton for metastatic work up. A 72-year-old male, a known case of carcinoma of prostate, had bilateral orchidectomy in 2002 and while on hormones developed multiple bone metastases in 2010. He was treated with 153 Samarium ethylene diamine tetra methylene phosphonate (EDTMP). 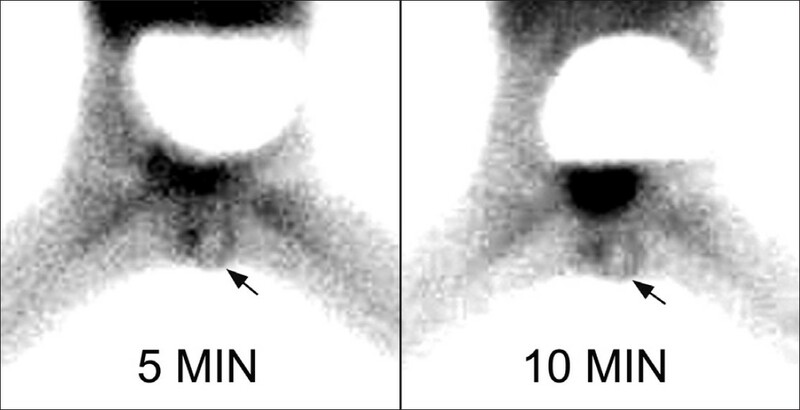 The author compares the features of 99m Tc methylene diphosphonate (MDP) scan and 153 Sm EDTMP bone scan, highlighting the similarities of skeletal uptake.